Having been given the opportunity to write this blog, and being completely technophobic (which is something I am working on) I’m hoping this blog reads well and you too feel the passion and enthusiasm I have for my shop, for independent business and for supporting independent retailers in general. Background to Birds Yard: How it all started! 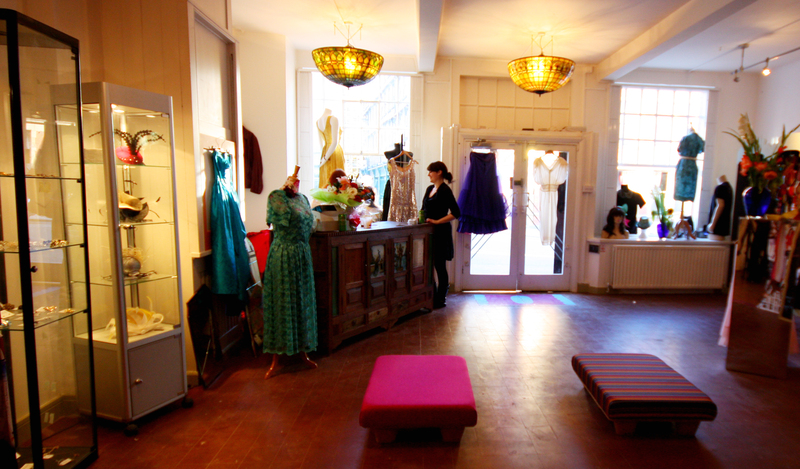 I had a shop 5 years ago (www.birdshell.co.uk), that specialised in ladies vintage evening wear. I got a shop on a short term lease just to see whether there was a market for my taste in clothing or whether I just dressed a little unusual. I had no idea really what I was doing other than knowing there was a huge gap in the market for the type of clothes I wanted to sell (and buy). This meant that I paid rent each week but had no idea of marketing and other factors that needed to be considered when setting up a business, or in the main, where to look for this support. Luckily it was so unique that I had stylists coming from London to buy from me, and a few wardrobe people for TV. In 10 months I sold dresses for the soap awards, Miss World competition, a popular local soap and a Sky sitcom. Following demolition of that shop I wanted to set up a shop exactly like I have now, alas I had lost my mojo, so went back to the day job which was Human Resources (very different to the life I am currently living). I suddenly thought one day that it was ‘now or never ‘ for the idea I had for a long time : to set up an independent hub of local creative people to showcase and sell their products in a static space. The market is saturated with fairs these days, so I believe they have lost their spark and attraction. Birds Yard was born on 31st July 2010! Drawing on my experiences from Birdshell, both good and bad, on July 31st 2010 Birds Yard opened its doors in central Leeds (www.birdsyard.co.uk). I am very proud of the reputation it has gained and plans I still have to keep it growing. As with most independent shops, we are not next to Topshop or the like, but a stones throw from the central shopping area, awaiting discovery! What is Bird’s Yard? 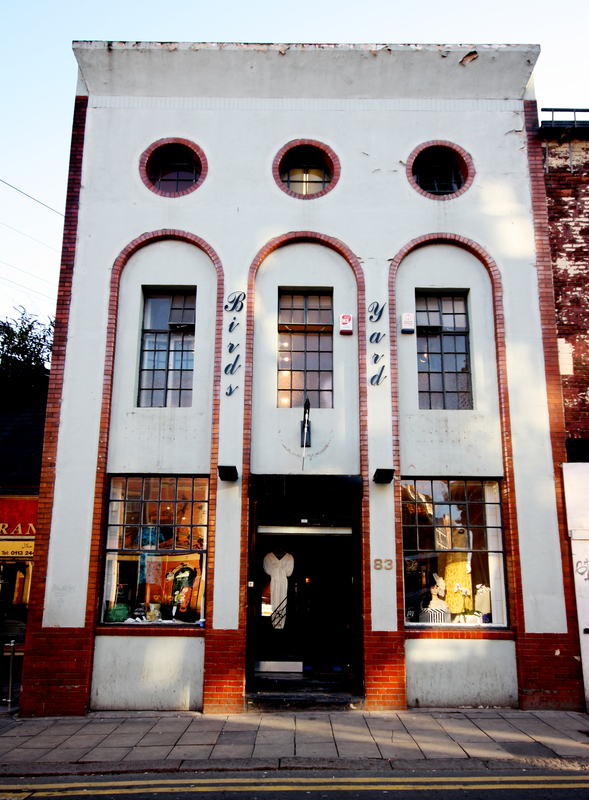 Home to independent boutiques… & more! Bird’s Yard is a 3 floor independent boutique that houses vintage, ladieswear designers, jewellery, milliners, art, crafts, homewares, hair salon, furniture, customised t shirts and just about anything you could ever think of wanting to buy that there are not a multitude of in a high street store. A fabulous shopping experience for customers, a perfect home for independent retailers! I have drawn on all my experiences as a shopper and my short spell as a retail outlet and this has given me an insight into exactly what I can excel in on both accounts. I not only want to build this great brand that offers a fabulous shopping experience to customers, I also offer a range of different sized spaces to suit all requirements. For instance I have people renting small spaces on the ground floor(in the main people with full time jobs or children to care for, to 7 self contained shops on the upper 2 floors which are so affordable and suit those wanting to try a shop but not wanting to commit to a long lease or scared off by utilities and rates! I often find myself giving advice on product showcasing, customer service and anything associated with business, and wondering how did I get here. The whole shop is brimming with great products and great people and we try to get involved with as many local events as possible, e.g. we recently dressed Miss World university, and are about to dress 30 finalists for Miss Black Yorkshire. All very exciting. Having been likened to the Corn Exchange in its hey day and mentioned as one of Europe’s most unique boutiques, alongside very reputable shops in Berlin, Ibiza, Rome and Paris by the Running In Heels blog, I believe we have a very unique formula, winning Best Newcomer at Leeds Retail Therapy awards (voted by the public), after only being open for 3 months. We are about to celebrate our first birthday on Friday 29th July, and shall be celebrating surviving the first year and welcoming the second. 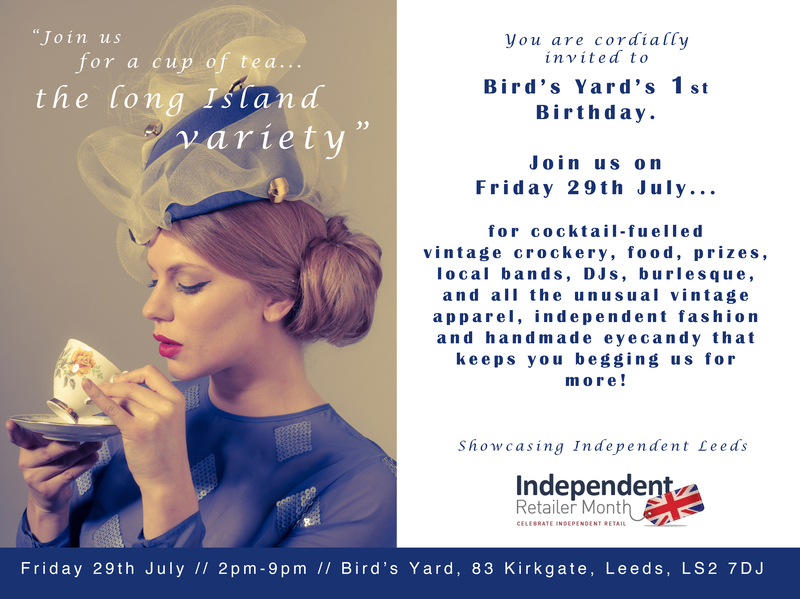 In support of Independent Retailer Month, we are going to have other local independent businesses come and showcase their product at our party by offering them an hour each in our specially set up marquee at the shop. This will be everything from restaurants, bars, shops and burlesque!! We are so excited about it being the first year Independent Retail Month has been celebrated in the UK and even more so that it falls on our birthday month so we fully intend to watch the local businesses come together in support of each other. I fully intend to run similar events post party, where numerous varying independents come together to “show off” their product, so that we can break this chain of behaviour in high street shopping and in doing so, keep the independent market thriving and each city its own identity! If you can make the party, you are of course invited, and if not, we would love for you to come and say hello to us any time. Thanks for taking the time to read my blog, Michelle Walton aka Bird. This entry was posted in Blog-a-day for Indie Retail, Independent Retailer Month 2011 and tagged birds yard, independent Retail. Bookmark the permalink.